What Do I Need To Tow A Trailer? Attaches to the underside of the vehicle and has a 1-1/4" x 1-1/4" or 2" x 2" receiver opening. The trailer hitch attachment points align with existing holes in the vehicle frame whenever possible. For heavy-duty applications, 2-1/2" x 2-1/2" receiver openings also are available. For an in-depth review of the different types of trailer hitches and how they are used, visit our detailed hitch information page. Also called a "drawbar," this is the piece that slides into the trailer hitch opening and provides a platform for mounting the ball. Ball mounts are available in different heights, sizes and styles. 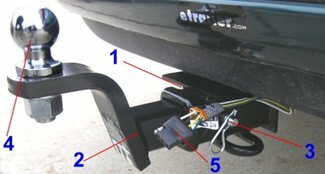 Make sure you get the ball mount that will fit your hitch opening and allows your trailer to stay level during towing. If you are unsure what size trailer hitch you have, we have put together information that will help determine your hitch size. To determine which ball mount is correct for your vehicle and trailer, visit our page on choosing the correct ball mount. A pin and clip device is used to hold the ball mount inside the trailer hitch receiver opening. Hitch locks are also available and provide additional security by preventing theft of your ball mount or other hitch accessories. 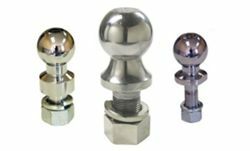 Hitch balls are available in three different sizes, 1-7/8", 2" and 2-5/16". This is a measurement of the ball's diameter and should be the same as the coupler of the trailer you plan to tow. The ball sits on the ball mount and provides the attachment point for the trailer. If you plan to tow several trailers with different size couplers, you will need either a different hitch ball for each of them or an interchangeable ball system. A wiring harness provides power and signals to the lights of a trailer. All vehicles that tow trailers are required by law to have a wiring harness to power the trailer's lights. For many vehicles, a T-One wiring harness that simply plugs into the vehicle's wiring system is available. For these cars and trucks no cutting or splicing is required to connect your wiring. Otherwise, you will need to hardwire the vehicle. This is done by simply using quick-splice connectors to connect the wires. For more information about how to wire for towing a trailer visit our wiring information page. For extra help, check out our video. Arrived as scheduled... Attached beautifully and looks great too... Thank you!